If you are looking for something romantic and street style appropriate, then I am more than happy to share with you this gorgeous compilation of cool ladies outfits to wear this spring. I am pretty sure, these looks will inspire you to buy something sweet and ladylike this year. The spring season is all about colors and prints. Your heart starts to dance, as we see everything blossoming. I think it's time to wear florals, rich motifs, bright colors and feminine silhouettes. Here we see sweet and feminine outfits, featuring mini skirts in bold colors, stripes, as well as denim basics (shirts, jackets, blouses), midi skirts combined with long-sleeve shirts and tees and layered with cropped jackets. Anyway, let's check out these images for your spring inspiration. 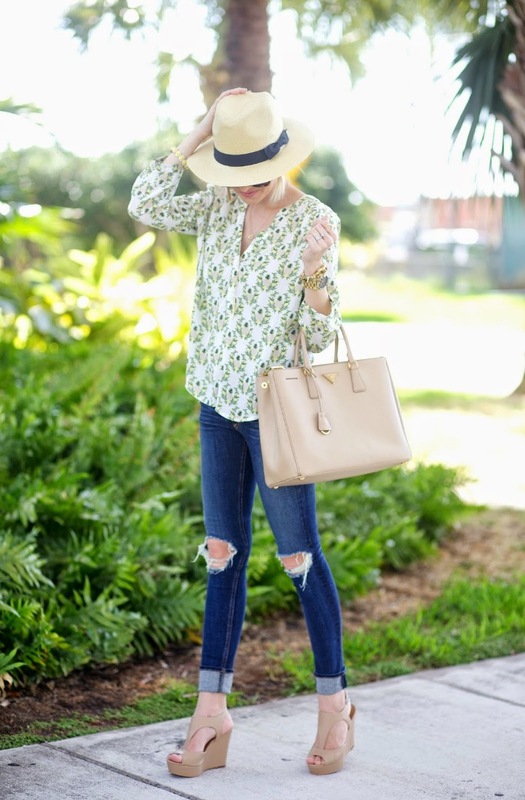 Semi sheer white shirt is styled with pale turquoise floral scarf, black skinnies, Nike runners and bright green tote bag. Pale blue biker denim jacket is layered atop lace white tee which is tucked in knife-pleated lightweight blush colored long skirt. Red colored blazer is worn atop dark blue denim shirt which is tucked in striped mini skirt and styled with suede dark blue boots. Dark blue pullover is worn with tartan mini skirt and pointed-toe slippers. Long robe-cardigan is worn atop semi-sheer white shirt and paired with cuffed dark blue jeans. Fuchsia colored blazer looks bright worn atop white tee which is styled with cuffed denim pants and yellow pumps. Keep it bold and creative by wearing a cool wide-brim fedora, blue shirt tucked in bell-shaped high-waisted skirt. White top looks awesome tucked in rose print bell-shaped skirt and styled with fuchsia pumps. Floral tank is teamed with cuffed and ripped light blue jeans. Pale purple coat is worn atop blossom flared blouse and paired with ankle-length white skinnies. Love that ladylike Cowboy look. We see a wide-brim hat styled with blush suit jacket, white tee and slim-fit ripped white skinnies. 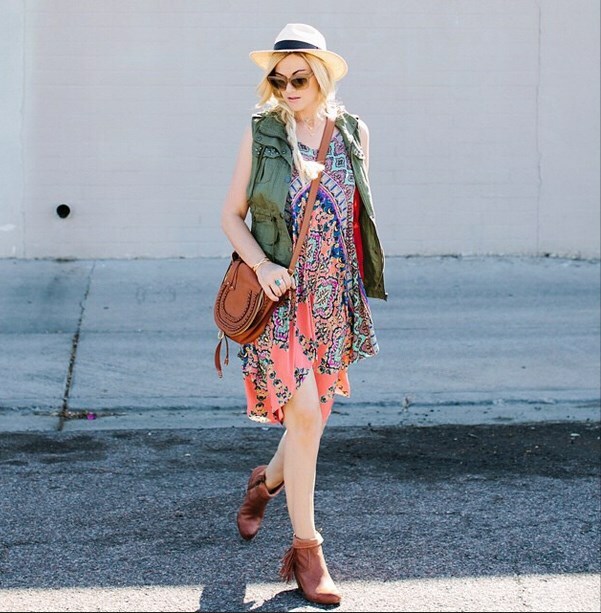 Let your boho chic hippie spirit out. Try on lightweight romantic dress worn atop khaki green vest. Love the handbag and those fringe booties. That's a cool office appropriate look. We see a semi-sheer blouse tucked in high-waisted black skirt printed in white roses.